Places to visit in Tenerife. The best offers in accommodation, turistic activities and rent a car. In addition to its fantastic weather and endless beaches, there are many interesting things to do in Tenerife, an island blessed by nature. The 3.718 meters high of the Teide, conditions the trade winds, giving rise to several different microclimates and ecosystems, as well as an endless number of unusual landscapes that you can enjoy on your holidays in Tenerife. Just take a look at the map of the protected spaces to understand why Tenerife is a jewel of nature. There are also a lot of culture to enjoy in Tenerife, Canaries is geographically the meeting point of three continents, Europe, Africa and America. Therefore when visiting Tenerife you find peculiar traditions, commodities and social models that are part of the extraordinary cultural diversity of Spain. It should also be mentioned that Tenerife is very interesting from the ethnological point of view, the steep orography where their grapevines are cultivated makes its wines simply unique. There many things to in Tenerife related to ethnology. Considering its fascinating nature and its exceptional cultural mix, it is not surprising that we have two World Heritage Sites to see in Tenerife, Teide National Park and the historic center of San Cristóbal de La Laguna. Consult also our guides of cultural tourism of Gran Canaria, La Palma y Lanzarote. These are the indispensable places to see in Tenerife, clicking on the image directs you the best link available to expand the information. There are many things to do in Tenerife and they are best enjoyed by knowing a bit of its history. Diego de Herrera arrives at the island of Tenerife and signature with the mencey of Anaga the known “Bufadero Paces”. 1477 The Catholic Monarchs removed the nominal domain of the Herrera de the island of Tenerife. Promoting its military occupation. 1493 Alonso Fernández de Lugo began its conquest of Tenerife under the rule of the Catholic Monarchs. 1494 After the battle of Acentejo the Castilian troops are defeated by the Guanches. 1495 Alonso Fernandez de Lugo returned to Tenerife with better armed and trained army starting the definitive conquest of the island. 1519 A royal decree that forced the natives to live in houses and villages were established. 1525 Die the advanced Alonso Fernandez de Lugo, making a transition from the traditional economy and the new colonial system. 1552 First Pirate attack to Santa Cruz by the hand of the French pirate Antoine Alfonse de Saintonge, who died of a clever kick sent from the santacrucera strength. 1554 A second fortification is built by order of the new governor of Tenerife, Juan Lopez de Cepeda between the creek of Blas Diaz and the Butchers Beach. 1705 The port of Santa Cruz happens to occupy the priority place after the volcanic eruption of Trevejo, that buried of lava the flourishing port of Garachico. 1797 The British fleet under Horatio Nelson attacked Santa Cruz, who lost an arm and also the battle. 1833 Santa Cruz de Tenerife is named capital of the province of the Canary Islands, in conflict with the cities of La Laguna and Las Palmas. 1927 During the dictatorship of Primo de Rivera, Canary province is divided into two, forming the provinces of Las Palmas and Tenerife. 1977 Two planes collide head at the airport of Los Rodeos (Tenerife North) causing the tragic plane crash of history with 583 fatalities. 2007 Inauguration in Santa Cruz de Tenerife of the only Tramway existing in the Canary Islands. Some of the things to do in Tenerife are about attending to the cultural life of the island. Besides all the things to do in Tenerife, it is essential to try its cuisine, the result of cultural fusion and the extraordinary quality of local raw materials. Starters Grilled goat cheese with two mojos, crispy eggplant with honey, gofio escaldón, Canary stew, Canary ranch, wrinkled potatoes and potatoes with meat. Stewed goat, rabbit in salmorejo, pork in sauce, carne fiesta (fried pork with species), meatloaf, beef stew, dumplings, pork steak and pork chop. Fish Grilled Cherne, grilled Vieja, stewed octopus, grilled cuttlefish, cod with onions, grilled sardines, fried mackerel, tuna marinated, grilled tuna, cod in sauce with potatoes, amberjack, pompano, snapper and samas. Desserts Frangollo, escachado banana, bienmesabe, roasted milk, cream caramel, sponge cake, carnival tortillas, moles eggs, mantecados rolls and trout. Wines and Drinks Wines with denomination of origin: Tacoronte-Acentejo, Valle de la Orotava, Ycoden-Daute-Isora, Abona, the Valley of Güimar. Other Products Goat cheeses, gofio, typical Canarian crafts. You can also check out the best restaurants in Tenerife according to TRIPADVISOR by clicking on the icon. The best accommodation offers for Tenerife at this moment. Tenerife is very well connected by air, has two airports, one in the south Reina Sofia and in the north Los Rodeos. To book your flight at the best price, we offer several search engines, they all offer you the possibility to also book flight + hotel. Click on the banner to find the best offers. You can also check eDreams offers by clicking on the banner. Do not go around and around, reserve your parking space by clicking on the banner. 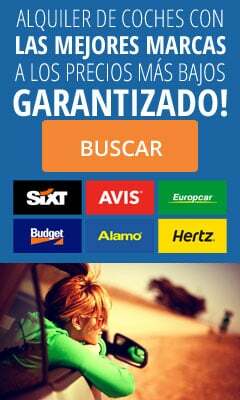 The best price for rent a car in Tenerife. Any more things to do in Tenerife? Any suggestions for holidays in Tenerife? Visit La Palma "La isla bonita"